Our second day in Paris was suppose to be a small group tour of the Palace at Versailles. 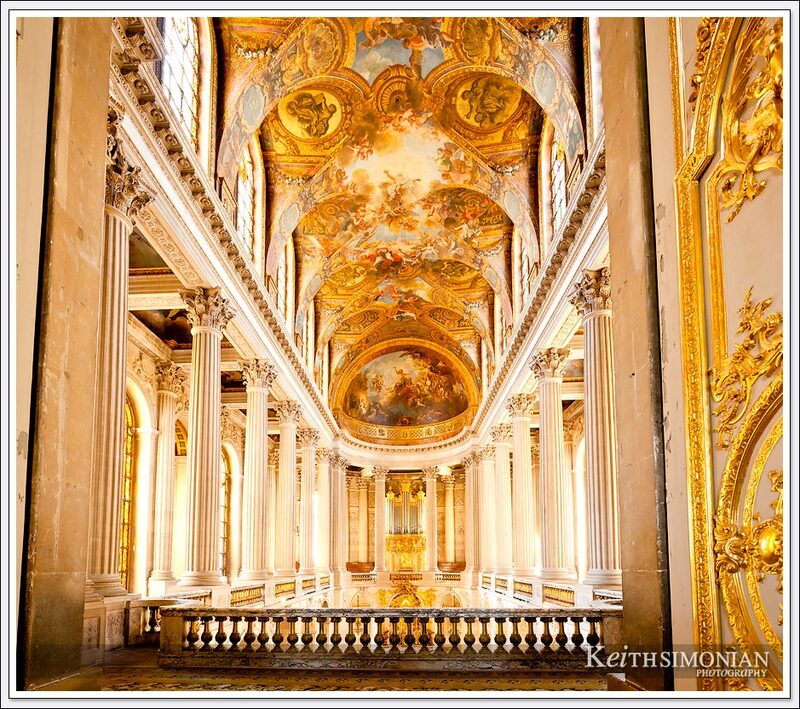 We would be in a small group touring Versailles along with every other person in the world who visited the Palace that day. Our meeting spot for the trip to Versailles would be just a few blocks from the Eiffel Towel. While we waited the first group of 10 left for the tour of Versailles. That left only my wife and I waiting to go. So it turned out the small group tour would only be myself, my wife, and the tour guide. Since I rarely listen to the tour guide as I just want to take photos, my wife was given a private tour of the Palace of Versailles. 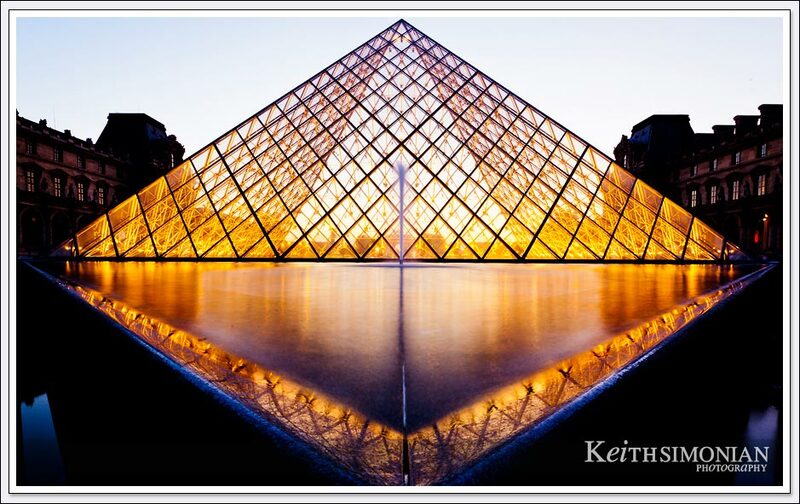 Even though there a many, many amazing things to see inside the Louvre, outside you can view the quite spectacular glass pyramid and the reflection pool at night. 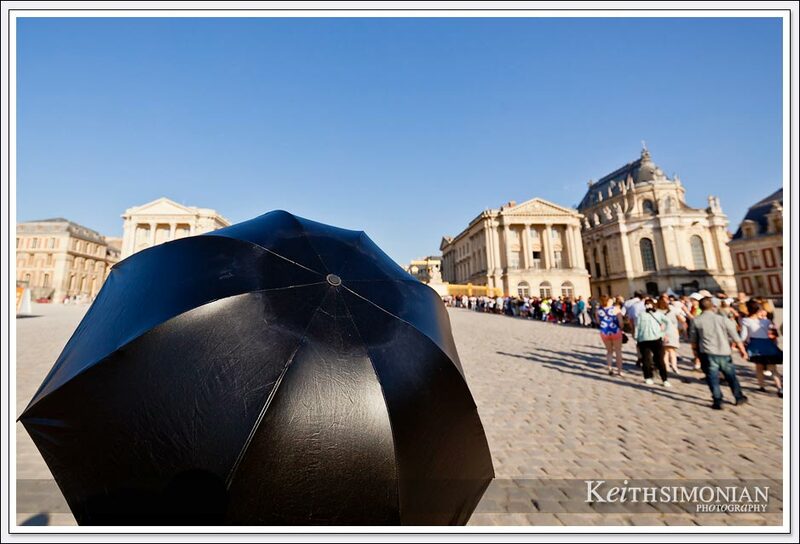 The line to get the Palace of Versailles can be quite long. It costs more, but taking a tour gets you in much faster. 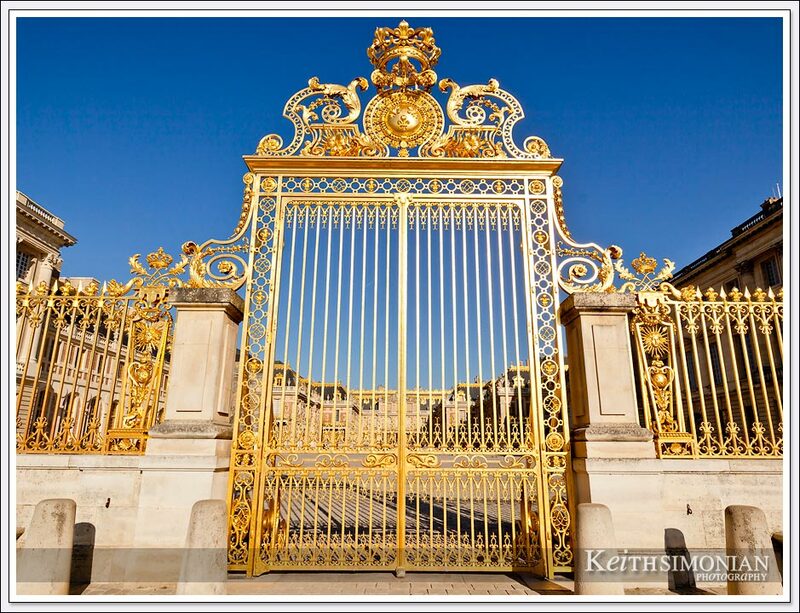 The restored Gold leaf on the gates that lead into the palace. The doors were opened and you looked into just another amazing view inside the palace. Our tour guide mentioned it took 10,000 people to maintain the Palace so the King could have things just right. I replied, that I was sure they were all well payed and happy to work quite hard for the King. The look I got back was “you really can’t believe that”. I don’t. Things generally don’t end well when so few have so much, and the majority has so little. The War Salon just outside the Hall of Mirrors. 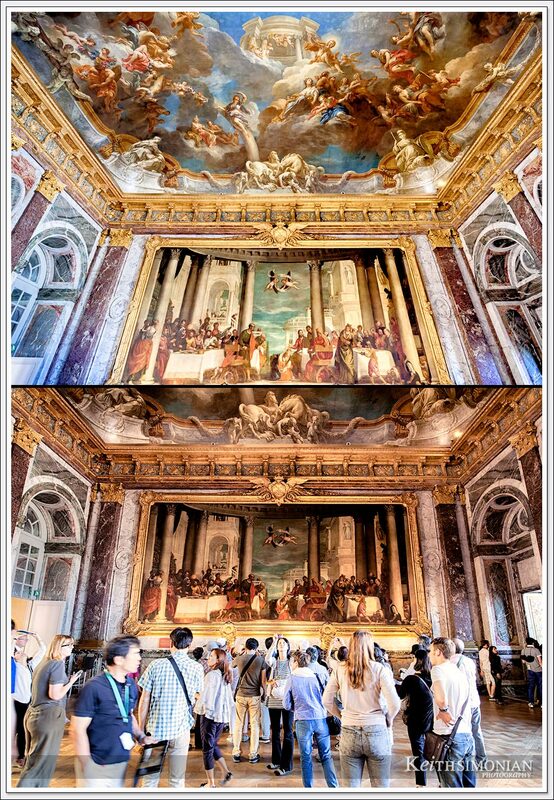 The top part of this photo combination is how you imagine viewing the amazing art work and paintings while at the Palace of Versailles. The bottom portion shows the reality of visiting a popular tourist spot during the busy season. It’s you and thousands of other people from around the world all crowding in to see the same sites. All the really talented photographers make sure to get themselves in the reflections when taking a photo. 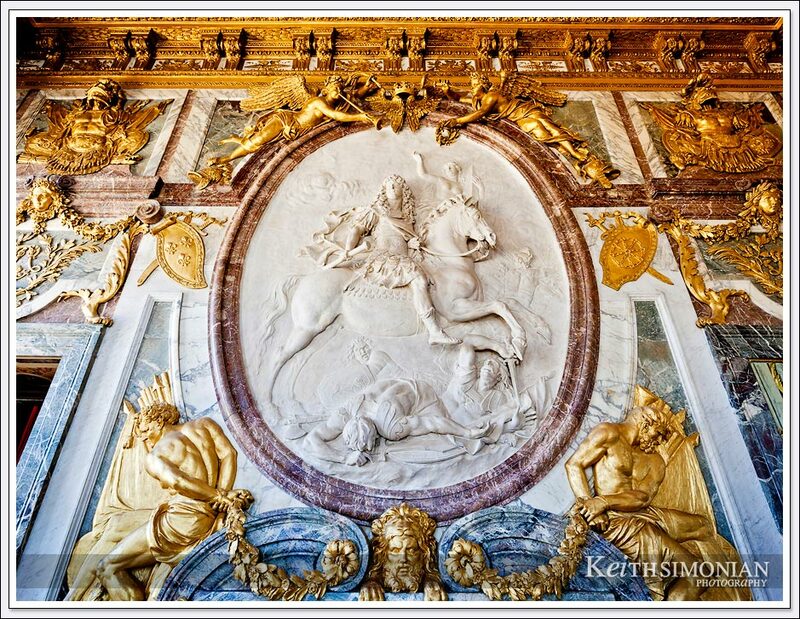 This image is from the Hall of Mirrors. So after exiting the Palace our tour guide said we would meet her down by the Grand Canal. She then mentioned that there was a nice view off to the side before we walked down to the Canal. Taking her advice we walked over to the side to view the “Side Yard”. Of course it’s not really called the side yard, it’s called the Orangery parterre where the Orange trees spend the summer months. 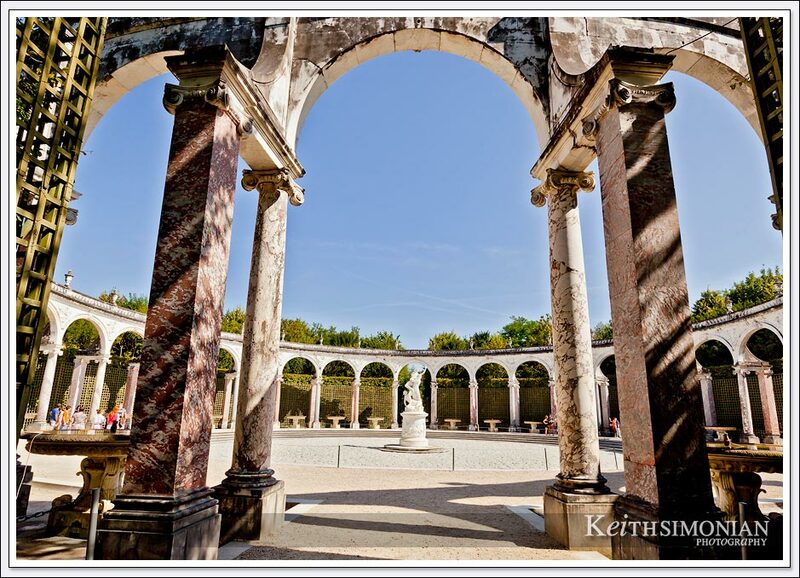 The central isle in this photo is 155 meters long and leads to the Lake of the Swiss Guards. That’s one heck of a side yard. From the level of the side yard you can’t see all the grounds and all the way down to the Grand Canal. So we headed over and down to the make our way to the Grand Canal. As the view of entire “backyard” came into sight, I muttered several swear words to myself in complete astonishment as to the size and grandeur of the grounds below the palace. I haven’t been everywhere and seen every thing, but in the past few years I’ve visited many of the world’s most amazing places. 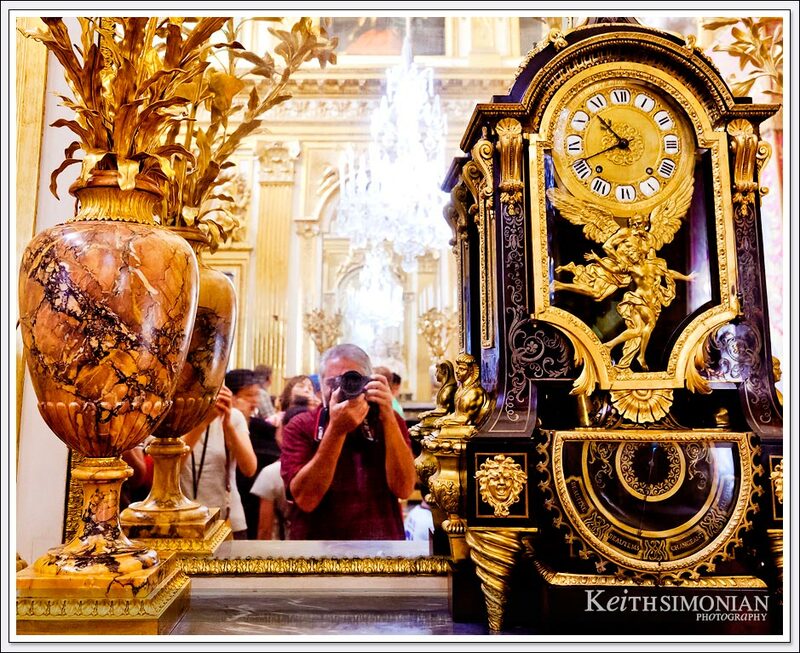 Just three days before visiting Versailles, I viewed the interior of Buckingham Palace. Just minutes before this view, I was inside the Palace of Versailles. The year before I toured the Vatican and stood under the Sistine Chapel. I walked thru St. Peter’s Basilica. I’ve ridden down to the bottom of the Grand Canyon. 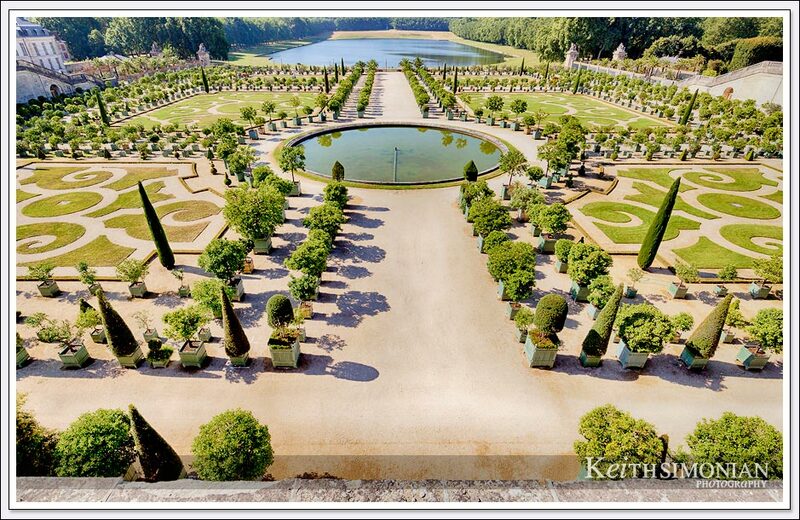 Yet none of those amazing sites prepared me for the immense size and grandeur of the gardens that the Palace of Versailles encloses. 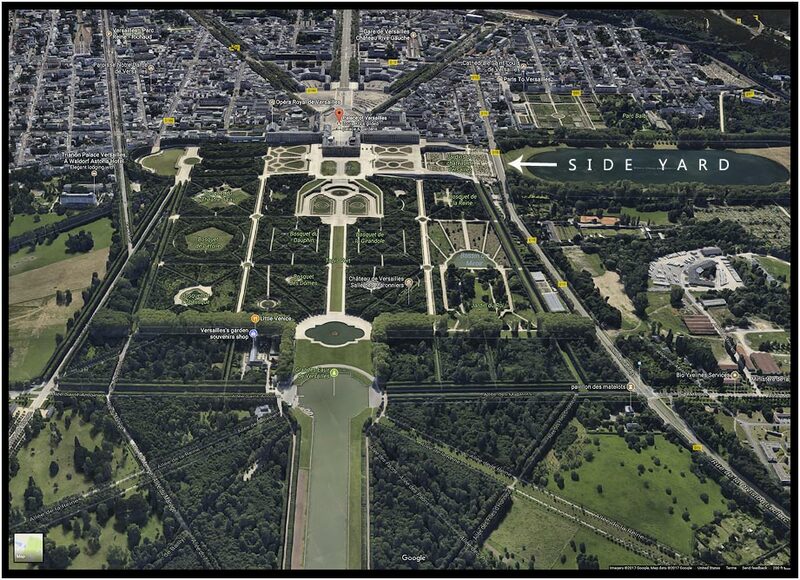 This satellite photo from Google with my extra text shows the “Side Yard” or as it’s more commonly knows as the Orangery parterre of the Palace of Versailles. This statue in the gardens of the Palace is of Pluto and Proserpine. 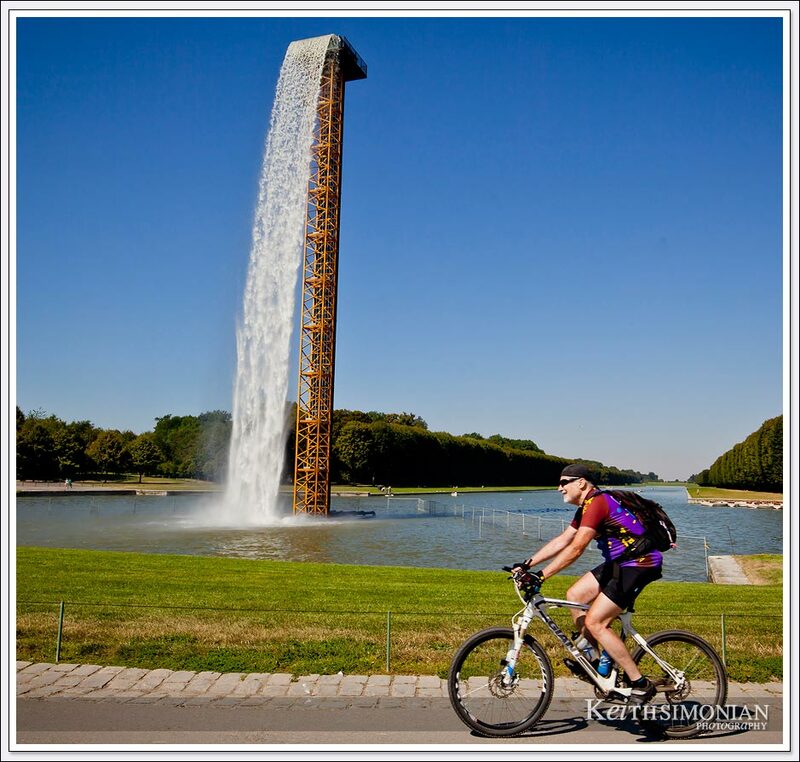 While researching the images for this post I found out that this waterfall in the Grand Canal was just a temporary art work that was there from June to October, 2016. We certainly timed our visit right. The waterfall is the work of Olafur Eliasson. 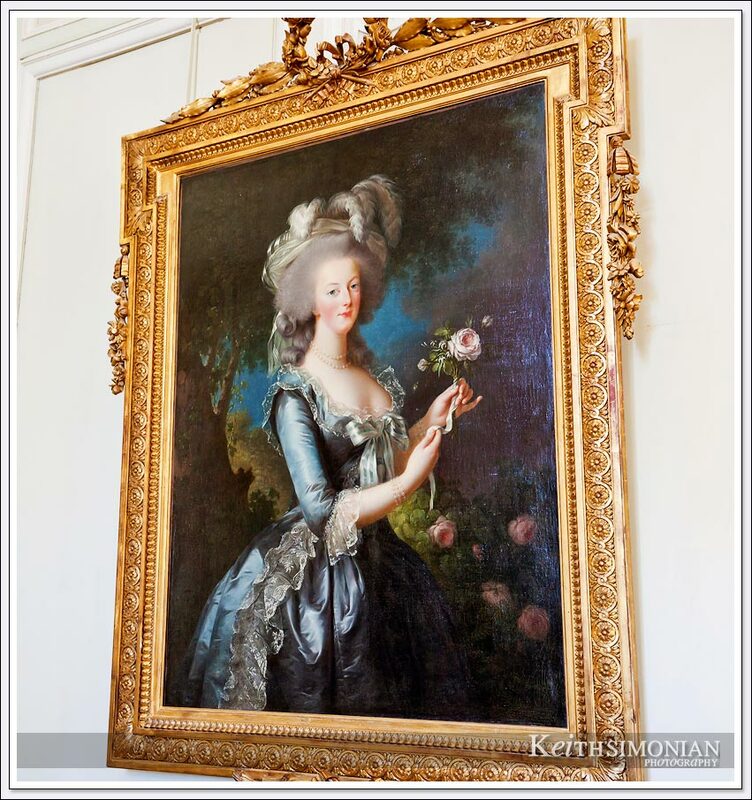 This painting is of Marie Antoinette which hangs in the Marie Antoinette estate which is just a hop, skip and a jump from the Palace. 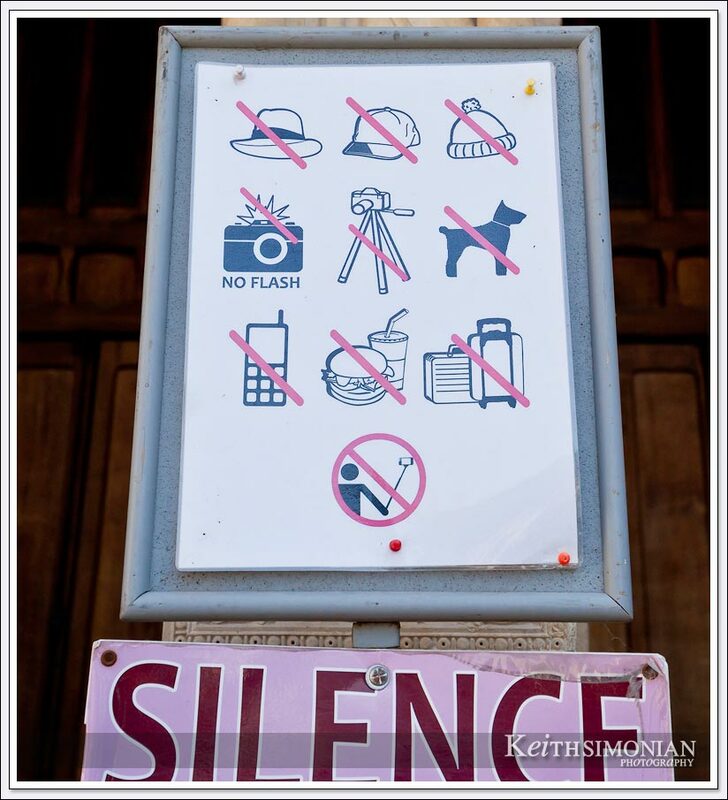 You know you entering some place important when you see a sign telling you all the things you can’t do. This sign greets you as you enter Notre-Dame. 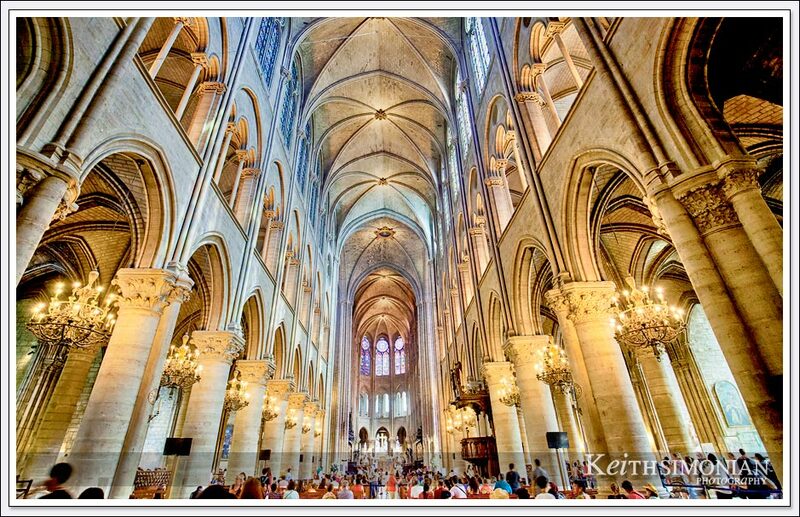 Interior view of Notre Dame Cathedral. A stop at Notre-Dame ( yes I spelled it both ways for Google ) wasn’t planned for the day as the trip to the Palace of Versailles would take the whole day. But as the tour was only the two of us, it went quicker than expected. Then on the trip back to Paris from the Palace I inquired to our tour guide how far away from the drop off point Notre Dame was. First she explained it wasn’t very far and how to get there. Then she said she would just drop us off their as we were finishing the tour an hour early. Sweet. 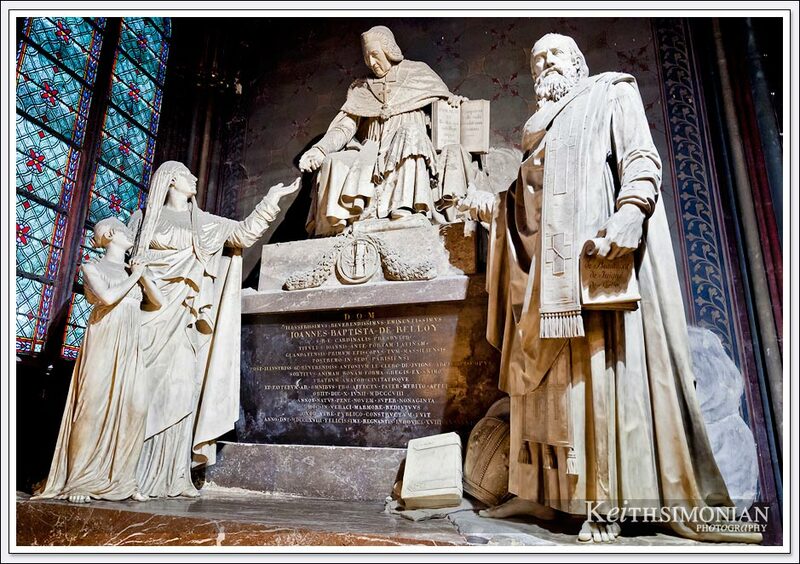 I’m not sure why this statue in Notre Dame erected by Napolean as a monument to Joannes Baptista de Belloy is so dusty. 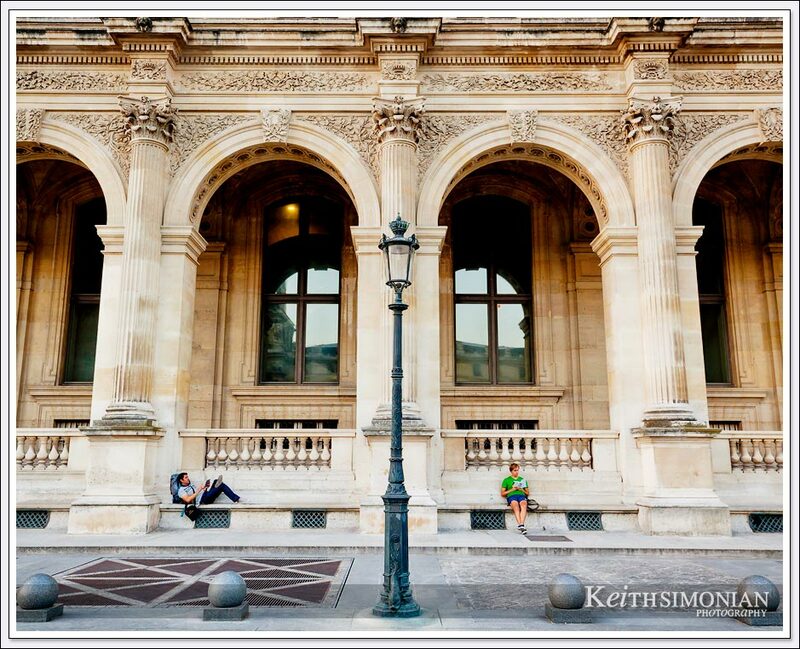 The courtyard of the Louvre in the evening it turns out is a great place to plop down and read a book. 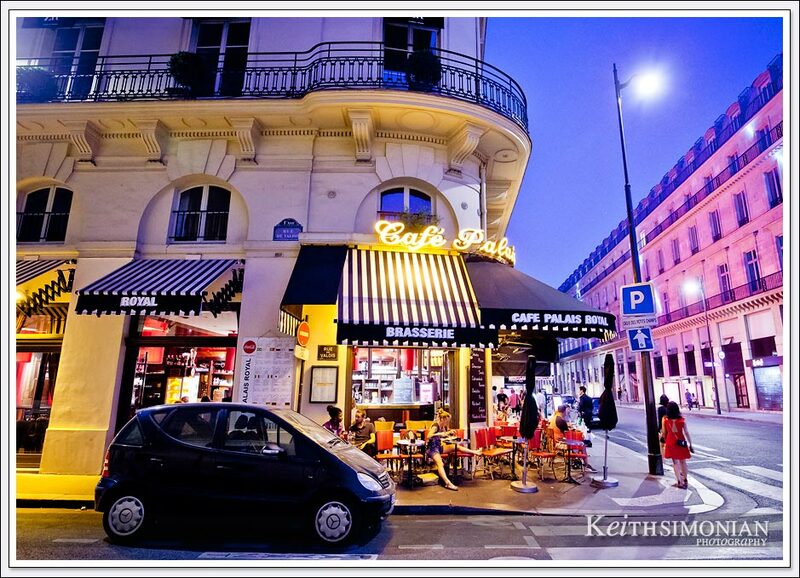 The Cafe Palais Royal has a 2.7 star rating on Google. I agree. The cafe was just 70 meters or so from our hotel. I got a quick breakfast there one day. To repeat, I agree with the 2.7 stars out of 5 possible stars. On the other hand, it made an interesting photo at night.